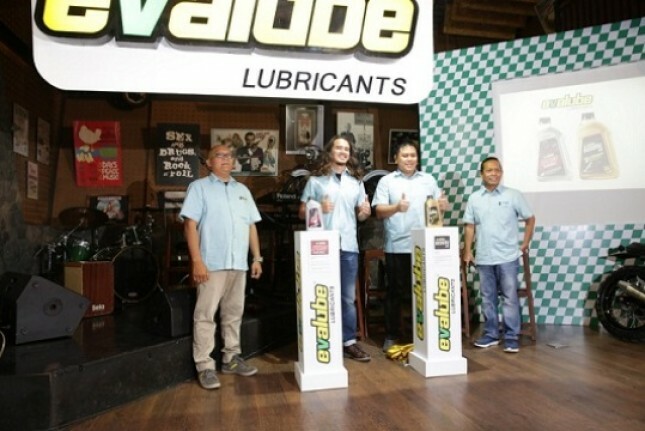 INDUSTRY.co.id - Jakarta - Evalube, the original Indonesian lubricant brand, recently introduced two newest oil products, the Evalube 4T PRO RACING SAE 5W-30 API SM / JASO MA Full Synthetic with PAO + Ester and Evalube SCOOTIC RX SAE 10W-40 API SL / JASO MB Full Synthetic. The presence of both new products is the commitment of Evalube to always deliver a variety of quality products with the best performance. The move also became one of the business strategies to anticipate competition in the synthetic oil business. Both new products are intended to target motor sport market and maxi scooter in Indonesia. Evalube 4T Pro Racing SAE 5W-30 API SM / JASO MA is manufactured to be synthetic oil with a special mixture of PAO + Ester. The special blend will provide additional power for mesih and increase vehicle acceleration, keep engine operating temperature low, oxidation rate more stable and reduce the crust on the machine. The lubricant is suitably used for four-stroke (4-stroke) engines with a capacity of 250 cc and above, particularly recommended engines for using SAE 5W-30 API SM / JASO MA lubricants. The second product is lubricant Evalube 4T PRO RACING SAE 5W-30 API SM / JASO MA Full Synthetic with PAO + Ester. This product has been tested both Field Trial and testing at the Laboratory by Evalube and in cooperation with one of the international partner additive companies. Brand Ambassador Evalube, David John Schapp, has also felt the sensation of this new product using the iconic bike Evalube with touring trip, approximately 165 km from Bandung to Jakarta along with Bandung custom motor community. "My experience touring using iconic bike Evalube with Evalube 4T PRO RACING oil makes travel touring more exciting. The pull becomes light, the temperature is stable and does not experience any constraints. Anyway really good motor, when using Evalube 4T PRO RACING this! Going forward, I will use this motor and oil to touring even further, and I can not wait to use Evalube 4T PRO RACING on my trail bike. "Said David John Schapp. Meanwhile, the new product Evalube Scootic RX Full Synthetic SAE 10W-40 API SL / JASO MB is a lubricant developed with Evalube Scootic HX and Scootic YX lubricant formula and has been tested by LAPI-ITB. However, the improved performance of these products is done using full-synthetic multigrade oil base and is accompanied by VELTEC & Star Molecules technology designed to meet lubricant stability standards, engine temperature remains low and maintain optimum oil viscosity at high temperatures. The lubricant uses Molybdinum Dithiocarbamate which provides exceptional protection against engine wear and produces excellent antioxidation performance, improves fuel economy and protects the engine optimally. This lubricant is suitable for use by all motorized two-wheeled vehicles scootic using 4-stroke Scooticengine with SAE 10W-40 API SL / JASO MB specifications. With the success of previous products, the sale of the two new products is expected to succeed, especially to answer the maxi scooter market challenge in the future. "We are excited about the launch of these two new products which are Evalube's flagship product in the face of the current trend in automotive and vehicle engines," said Yomie Harlin, Commercial Director of Evalube. Yomie explained, the number of brands and types of motorcycles up to 250 cc and maxi scooter emerging, the APM in the future seems to be continuing to launch various other types in this class. "In addition, we also see the interests of community friends, custom, racing, and touring who want a higher oil specifications in accordance with the needs of their larger motorcycle," said Yomie. One-liter Evalube 4T PRO RACING products are offered for Rp250,000 and the one-liter Evalube SCOOTIC RX product costs Rp57,000. In order to promote this new product, Evalube will perform various activities, both online and offline and invites the motor community to touring together.